Ideal for beginner or intermediate players the Casio CTK-3500 Portable Keyboard packs in some fantastic features. With hundreds of voices, built in accompaniment, lessons, Chordana app compatibility, dance mode and much more this is one portable keyboard that will make a permanent impression on your music. The CTK-3500 is loaded with 400 sounds taken for all over the world including piano's, organs, orchestral, synth, ethnic and more. Whatever sung you're on with the CTK-3500 will have a voice to suit you. Equally as impressive is the collection of auto-accompaniment backing that can be controlled by chords or by single-finger for players just starting out. The CTK-3500 has the ability to work alongside the free Android and iOS app Chordana. Chordana Play connects to the CTK-3500 and teaches you to play in a fun and visual way. Follow the music score or piano roll notation at your own pace, with the app guiding you through each step. For times when you simply want to have a little fun you can engage the Casio CTK-3500 into dance mode. Create stunning electronic music with instant loops and effects including House, Hip-Hop and EDM. Remix tracks to your hearts content and impress your friends. 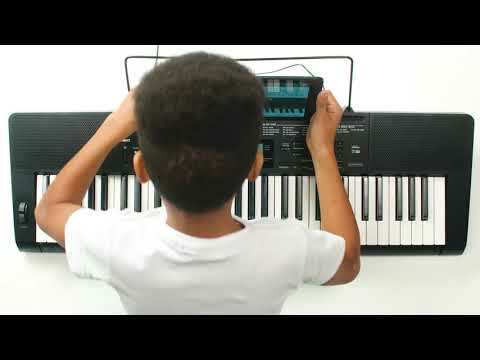 Fun and educational the Casio CTK-3500 Portable Keyboard is an excellent choice for the newer or younger player in your family. full of variation and capability the CTK-3500 was built to inspire. Dimensions L x W x H: 37.2" x 12.1" x 3.6"